"Meninx" redirects here. For the Tunisian island formerly known as "Meninx", see Djerba. The meninges (/məˈnɪndʒiːz/, singular: meninx (/ˈmiːnɪŋks/ or /ˈmɛnɪŋks/), from Ancient Greek: μῆνιγξ, translit. mēninx, lit. 'membrane', adjectival: meningeal /məˈnɪndʒəl/) are the three membranes that envelop the brain and spinal cord. In mammals, the meninges are the dura mater, the arachnoid mater, and the pia mater. Cerebrospinal fluid is located in the subarachnoid space between the arachnoid mater and the pia mater. The primary function of the meninges is to protect the central nervous system. The dura mater (Latin: tough mother) (also rarely called meninx fibrosa or pachymeninx) is a thick, durable membrane, closest to the skull and vertebrae. The dura mater, the outermost part, is a loosely arranged, fibroelastic layer of cells, characterized by multiple interdigitating cell processes, no extracellular collagen, and significant extracellular spaces. The middle region is a mostly fibrous portion. It consists of two layers: the endosteal layer, which lies closest to the calvaria (skullcap), and the inner meningeal layer, which lies closer to the brain. It contains larger blood vessels that split into the capillaries in the pia mater. It is composed of dense fibrous tissue, and its inner surface is covered by flattened cells like those present on the surfaces of the pia mater and arachnoid mater. The dura mater is a sac that envelops the arachnoid mater and surrounds and supports the large dural sinuses carrying blood from the brain toward the heart. The middle element of the meninges is the arachnoid mater, so named because of its spider web-like appearance. It cushions the central nervous system. This thin, transparent membrane is composed of fibrous tissue and, like the pia mater, is covered by flat cells also thought to be impermeable to fluid. The shape of the arachnoid does not follow the convolutions of the surface of the brain and so looks like a loosely fitting sac. In particular, in the region of the brain a large number of fine filaments called arachnoid trabeculae pass from the arachnoid through the subarachnoid space to blend with the tissue of the pia mater. The arachnoid is composed of an outermost portion (arachnoid barrier cell layer) with tightly packed cells and no extracellular collagen; that is why it is considered to represent an effective morphological and physiological meningeal barrier between the cerebrospinal fluid and subarachnoid space and the blood circulation in the dura. The arachnoid barrier layer is characterized by a distinct continuous basal lamina on its inner surface toward the innermost collagenous portion of the arachnoid reticular layer. The pia mater (Latin: tender mother) is a very delicate membrane. It is the meningeal envelope that firmly adheres to the surface of the brain and spinal cord, following all of the brain's contours (the gyri and sulci). It is a very thin membrane composed of fibrous tissue covered on its outer surface by a sheet of flat cells thought to be impermeable to fluid. The pia mater is pierced by blood vessels to the brain and spinal cord, and its capillaries nourish the brain. The arachnoid and pia mater together are sometimes called the leptomeninges, literally "thin meninges" (Greek: λεπτός leptos - thin). Acute meningococcal meningitis can lead to an exudate within the leptomeninges along the surface of the brain. Because the arachnoid is connected to the pia by cob-web like strands, it is structurally continuous with the pia, hence the name pia-arachnoid or leptomeninges. They are responsible for the production of beta-trace protein (prostaglandin D2 synthase) a major cerebrospinal fluid protein . The subarachnoid space is the space that normally exists between the arachnoid and the pia mater, which is filled with cerebrospinal fluid, and continues down the spinal cord. 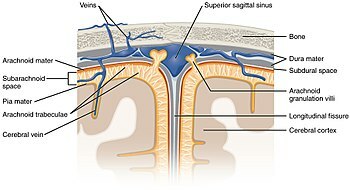 Spaces are formed from openings at different points along the subarachnoid space; these are the subarachnoid cisterns, which are filled with cerebrospinal fluid. The dura mater is attached to the skull, whereas in the spinal cord, the dura mater is separated from the vertebrae by a space called the epidural space, which contains fat and blood vessels. The arachnoid is attached to the dura mater, while the pia mater is attached to the central nervous system tissue. When the dura mater and the arachnoid separate through injury or illness, the space between them is the subdural space. There is a subpial space underneath the pia mater that separates it from the glia limitans. Injuries involving the meninges, can result in a hemorrhage and two types of hematoma. A subdural hematoma is a hematoma (collection of blood) located in a separation of the arachnoid from the dura mater. The small veins that connect the dura mater and the arachnoid are torn, usually during an accident, and blood leaks into this area. An epidural hematoma, bleeding between the dura mater and the skull, may arise after an accident or spontaneously. Other medical conditions that affect the meninges include meningitis (usually from a fungal, bacterial, or viral infection) and meningiomas that arise from the meninges, or from meningeal carcinomatoses (tumors) that form elsewhere in the body and metastasize to the meninges. In fish, there is a single membrane known as the primitive meninx. Amphibians, and reptiles have two meninges, and birds and mammals have three. In the early 1900s, Giuseppe Sterzi, an Italian anatomist, carried out comparative studies on the meninges from the lancelet to the human. Contrary to previous reports, the spinal meninges were seen to be very simple, both in the adult lower vertebrates and in the early developmental stages of the more advanced vertebrates. From the mesenchyme surrounding the neural tube only a single leaflet forms the primitive meninx. In the following phylogenetic and ontogenetic stages, the latter divides into an internal leaflet: the secondary meninx, and into an external one: the dura mater. Finally, in higher vertebrates, even the secondary meninx divides into the arachnoid and the pia. In the same animals, Sterzi demonstrated that, while in the spinal medulla the dura keeps its identity, in the skull it fuses with the periosteum. He also demonstrated the continuity of all meninges with the envelopes of nerves and with the filum terminale. Mammals (as higher vertebrates) retain the dura mater, and the secondary meninx divides into the arachnoid and pia mater. ^ Entry "meninx" in Merriam-Webster Online Dictionary, retrieved 2012-07-28. ^ μῆνιγξ. Liddell, Henry George; Scott, Robert; A Greek–English Lexicon at the Perseus Project. ^ Entry "pia mater" in Merriam-Webster Online Dictionary, retrieved 2015-11-27. ^ Kumar, Vinay (2015). Robbins and Cotran Pathologic Mechanisms of Disease. Philadelphia: Elsevier Saunders. p. 1273. In acute meningitis, an exudate is evident within the leptomeninges over the surface of the brain (Fig. 28-21). ^ Yamashima, Tetsumori; Sakuda, Kazushige; Tohma, Yasuo; Yamashita, Junkoh; Oda, Hiroshi; Irikura, Daisuke; Eguchi, Naomi; Beuckmann, Carsten T.; Kanaoka, Yoshihide; Urade, Yoshihiro; Hayaishi, Osamu (1 April 1997). "Prostaglandin D Synthase (β-Trace) in Human Arachnoid and Meningioma Cells: Roles as a Cell Marker or in Cerebrospinal Fluid Absorption, Tumorigenesis, and Calcification Process". Journal of Neuroscience. pp. 2376–2382. Retrieved 10 October 2017. ^ "Overview of Adult Traumatic Brain Injuries" (PDF). Orlando Regional Healthcare, Education and Development. 2004. Archived from the original (PDF) on February 27, 2008. ^ van Gijn J, Kerr RS, Rinkel GJ (2007). "Subarachnoid haemorrhage". Lancet. 369 (9558): 306–18. doi:10.1016/S0140-6736(07)60153-6. PMID 17258671. ^ a b Ostrander, Gary (12 September 2000). "The Laboratory Fish". Elsevier. ^ Kardong, Kenneth V. (1995). Vertebrates: Comparative Anatomy, Funuction, Evolution. Dubuque, Iowa: Wm. C. Brown Publishers. p. 539. ISBN 0-697-21991-7.